As complete self-build novices aware of the steep learning curve ahead, we were eager to get stuck into our passive house project. After deciding we wanted to build to the passive house standard, our next step was to find someone to design the house and prepare the planning application. Little did we know the extent of the challenge we faced. The decision to aim for the passive standard limited options of finding local expertise for the project. Our 0.3 acre site is outlined with beautiful mature foliage and a narrow road frontage. Previously the side garden of an adjacent home, it is in a reasonably densely populated area of Co Louth on a road lined with detached houses. The existing outline planning permission listed several conditions for the design, and our brief was for a comfortable, functional family home of around 250 square metres. 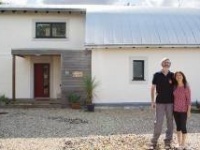 We found stories online of self-builders that had achieved the passive house standard for not much more than the cost of building to current building regulations, and we rather liked the sound of this too. External aesthetics and architectural features were never high on our agenda. We felt a simple design was important — because that’s who we are, and because it would help to control costs. We did not want elaborate external features, instead we wanted to prioritise the building fabric, energy performance and the function of the living spaces. Our preference was for timber frame construction and, as we saw it, there were three options worth exploring. The first option was an ‘off the shelf’ kit house — this seemed like the path of least resistance and was certainly appealing to use. 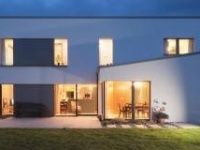 The second option we considered was purchasing a set of standard plans for a passive house. But the narrow shape and orientation of the site were not ideal for a typical longer, rectangular off-the-shelf passive house. Considering the conditions of the outline planning permission, and the context of the site, we decided neither of the first two options were the best for us. With a garden just off due south, orientation was in our favour for balancing energy losses and gains, and maintaining privacy at the front of the house. But the width of the site meant a narrow rectangular house the size we needed wouldn’t fit. We decided that option three, a bespoke design, was the best route. We felt it was worth challenging the conflict between the passive design principles of minimising the house’s footprint and external surface area, and the outline condition of a ‘storey and a half style’ dwelling. We didn’t await a bungalow ether — it would need a bigger footprint and would mean tearing up the mature trees we loved and leave a very small garden, defeating the purpose of the move. Our mission was to find someone singing off the same hymn sheet to develop a design and manage the planning application. 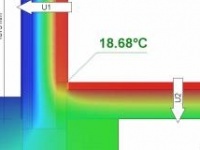 Completion of PHPP calculations early in the design stage was important to us too. We met several professionals offering the service we needed for prices that varied significantly. We quickly discovered that hiring an architect for 10% of the build cost was not compatible with building a house of sufficient size to make the project worthwhile. We were advised to build a smaller house initially, and to increase it in phases. This was not a viable option for us either though. We also struggled to find an architect aligned to our priorities of a simple design and minimal footprint — the suggestion being that to compromise on aesthetics by minimising external architectural features was completely nonsensical. We asked around and met with several people who could provide the service we needed at a lower cost than a fully qualified architect. All advised that the planning process was more likely to be successful if we just settled on a storey and a half, or dormer style. We decided to give one of them a chance and the first concept presented was a H-shaped bungalow, with a car port enjoying the evening sun! Back to the drawing board. 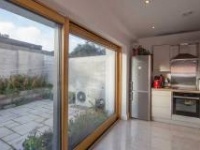 We finally met an architect who seemed to genuinely buy into passive house design principles and listened to our needs. We agreed a service that included design and PHPP calculations up to the submission of planning permission, so we have signed up to a fixed price contract and started preparing a detailed design brief for our new passive home. To be continued in the next issue.